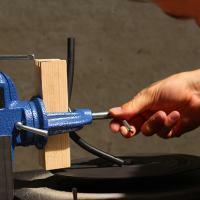 acoustic turntable © is a mechanical turntable consisting of a vise, a windshield wiper motor, and a metal disc mounted on it. The sound production is based on the friction of two or more materials which either are placed in the vise or laid on the metal disc. The momentum of the abrasion and concomitant sound transformation thereby plays a central role. With the ohrenhoch version different materials (turntable diamond stylus, chisel ...) encounter a stone slub with an engraved copyright sign which is slowly abraded and gradually vanishes completely. Audio Field Report no. 54 / Soundaktivismus 33: Interview mit Andreas Trobollowitsch von Knut Remond. A sheet of paper is ready for you to write down your thoughts, questions or answers. Your statements remain in the Soundgallery and thus will be readable for all visitors and sound activists. Andreas Trobollowitsch studied musicology an jazz theory in Vienna and Paris. Projects and works in the field of electroacoustic composition and improvisation. Compositions for film, dance, theatre, performances and radio features. Focus of work: conceptual compositions, sound installations, sound performances and drawing installations. CD releases on schraum (Berlin), Monotype Records (Warsaw) and cronica (Porto). DVD release (silent film music setting) for the Filmarchiv Austria (Vienna). Work presentations, concerts and exhibitions in Europe, Asia, North and South America.